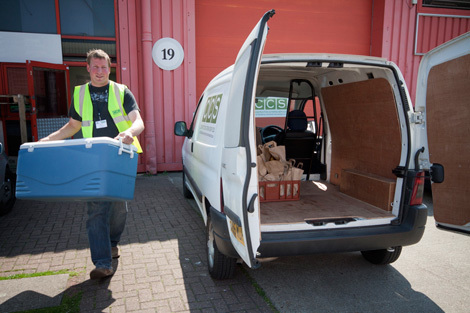 Construction catering was created to provide a cost effective and practical solution to on site catering needs. Be it mobile catering, building site catering or even portable canteens we ensure that construction sites have good quality food and refreshments available at the times they are needed and have found this to be beneficial to both staff and employers alike. 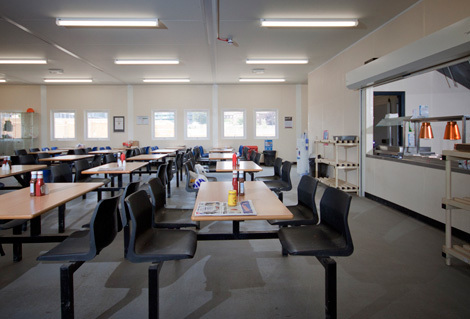 Many of the places that we service require remote site catering and operate out of normal working hours. Obviously the requirement to provide suitable facilities for staff is essential and we have a range of services designed to fit any location or site type. The benefit for workers is good quality subsidised food provisions including free tea and coffee, a good variety of refreshments and the ability to feed back to a dedicated service with requests and requirements listened to and acted on. We have a several options for picnic bags ranging from standard to premium. 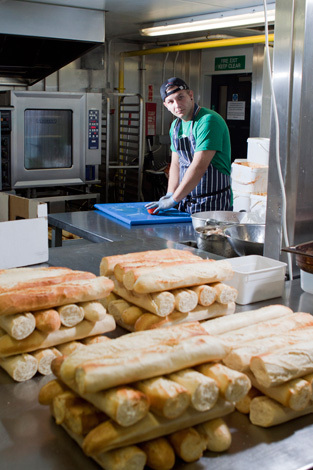 All sandwiches/baguettes are made fresh daily and delivered on a 24hour basis. 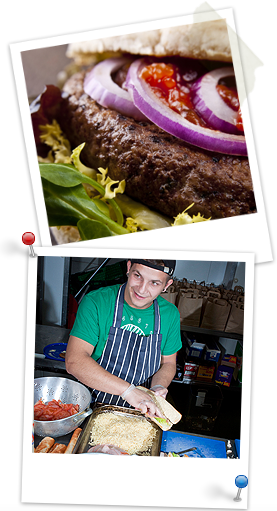 Our kitchen is centrally located to cater for the Greater London Area. Our clients range from offices to construction companies working through the night on such projects as the London Underground Rail Upgrades. Our prices are competitive and our service is impeccable. Our service caters for all ethnic backgrounds, we have a fantastic range of vegetarian options and offer a range of Halal and Kosher fillings. Please see the prices page for the various options alternatively give us a call and we can arrange a selection to suit your needs. Mobile catering units come in different sizes with different capabilities. 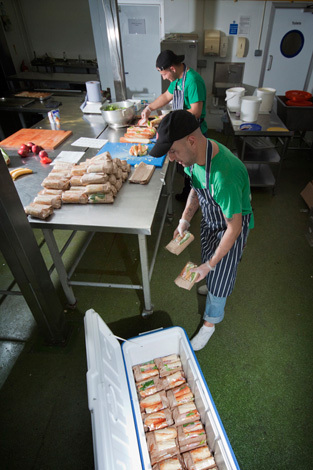 We have a wide variety of options to suit a multitude of sites giving us the ability to access difficult locations and provide food options to supply any size of crew from 25-3000. Our units are maintained to the highest standard and are constantly updated so that they remain in a new condition. Our staff are trained to service operatives in all environments and are especially experienced in working on projects that are running in 24 hour/7 day week capacity. Using the smallest of our units we can provide a simple tea and coffee service. With friendly and polite staff these simple units are a great way to keep staff fulfilled on site. Construction Catering Solutions have a wide variety of mobile catering units available to the construction industry. Our years of expertise have allowed us to fine tune exactly what works well in this highly specialised field. 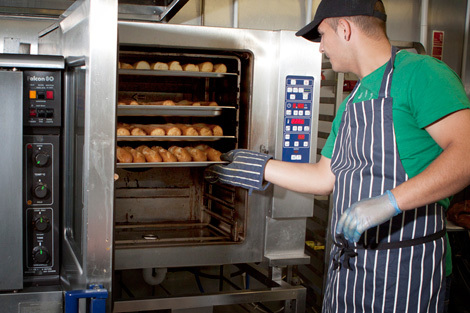 At CCS, we pride ourselves on delivering the best food possible on-site and at a subsidised rate to construction workers. 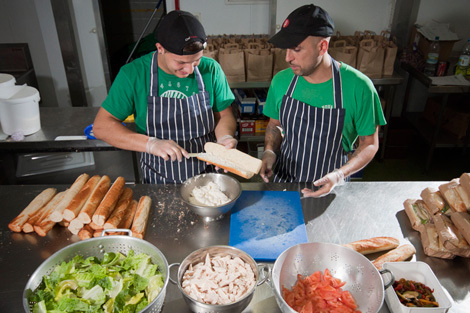 From burgers to baguettes, our catering units supply your workers and staff daily without them having to leave the site and pay extortionate prices within the London city centre and other metropolitan areas. If you want something else or a little more specialised click the options to the left to read more. We offer a comprehensive service which we can tailor to meet your site requirements. We will install and set up your canteen services. we will ensure the facility meets the required Health and Safety standards. It is essential to provide staff at the required level to match the various stages of build and commission, according to the manpower present on the building site during the construction progress.